In Lewis Carroll’s Alice’s Adventures in Wonderland, Alice falls down a rabbit hole, and finds herself in a parallel universe with a host of strange characters with their own brand of logic. To Alice, the language and behavior of the characters she meets is illogical and her major problem is accepting that Wonderland makes perfect sense to its inhabitants, if not to her. At the start of Full Pipe, Dude (your playable character) falls through an open manhole, into the Full Pipe world. Accept the fact that the other 44 characters (like Eggcracker and Guv-the drawer) you will meet (scattered throughout the 39 “rooms” of the Full Pipe universe) also have their own twisted brand of logic. Full Pipe can be described as the Dude’s Adventures in Weird World. In one of the early rooms visited by Dude, he meets Guv-the-drawer. Pick up that extra drawer next to Guv as you will need it. Of course, you suspect you will need to put certain items into that drawer and learn what Guv does with them, and you’re right. You quickly find your way into the basement where the maintenance men are engaged in a game of Dominos. They ignore you but they have something you need. Joshua and Jordann are trying to first figure out what it is, and then how to get it. There are eight mini-games in Full Pipe. Each mini-game may seem difficult at first but you (or more likely, one of the kids) soon discover how to control the mouse and time its movement to beat the game. Doing so opens up another room or retrieves a needed object. 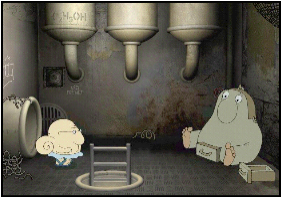 In the mini-game shown below, you send Dude up the ladder and jump him onto the end of the lever. 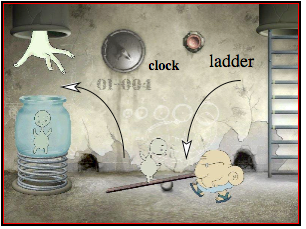 The trick is to time his jump so that the Small Fry walking onto the other end of the lever is catapulted into the jar. Fill the jar and the hand lifts it to clear another pipe opening that leads into a new room. There’s a handy map in the upper-right corner that makes navigating from room to room quick and easy. You can only navigate to rooms you have actually visited so the map builds as you progress through the game. The giant sleeping puppy is blocking the Dude’s transit of this room. What to do? One of these three characters has a crank the Dude needs. Hows to get it! Playing Full Pipe is not an endurance test so if a problem becomes frustrating, use a “spoiler”. Spoilers are hints or clues that “spoil” your pleasure in solving a problem, but advances the game. Spoilers can spoil part of the game. But so does reaching a point in a game where you just cannot progress any further. The short-lived, let-down experienced by using a spoiler is soon compensated by additional progress in the game. Grandad attempts to complete every game without using a single spoiler, but I do use a spoiler as a last resort. Here’s a spoiler for Full Pipe. Full Pipe is available on Steam (www.steampowerd.com) at the low price of $5. Download the demo, play through a few puzzles, and then decide to buy or not to buy. 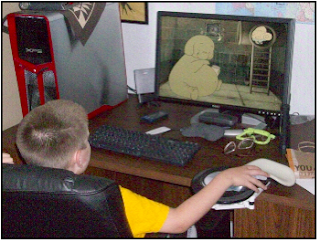 I am learning new ways to ensure that my grandkids experience games like Full Pipe and decide for themselves the extent to which they want to play through it or any other computer game. The choice is theirs to make, not mine. 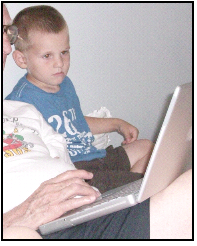 Recently I spent several days with John Patrick, our four-year old grandson visiting from his home in Belgium. During a rare, quiet, moment, when the other three grandkids were occupied elsewhere, I asked John if he would like to go through a story about a man that has his dog kidnapped by aliens. 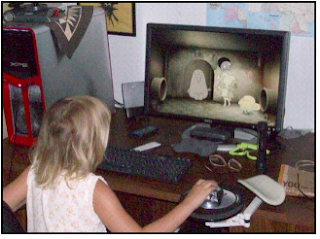 The problem is to help him rescue his dog (see Samorost 2 in the May 2009 folder). Even though John couldn’t solve most of the puzzles the first time through, he asked to play through the story five times!. By the third play-through, he was telling me what to do to solve each puzzle! 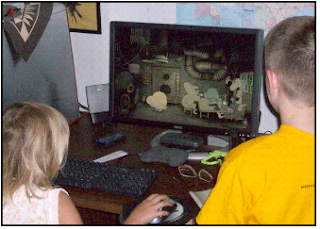 Certain computer games can be treated as interactive storybooks! Here John and grandad are playing Samorost 2.